CUPE members from across Manitoba came together to march in solidarity in Steinbach Manitoba’s first annual Pride parade and celebration, Saturday July 9th. While organizers originally expected roughly 200 participants, Manitobans gathered in numbers estimated between 3,000 and 5,000 to march, cheer, and support the Steinbach LGBTTI community. “CUPE is proud to have participated in such an historic event,” said Kelly Moist, President of CUPE Manitoba. “CUPE members from across the province came out in support of the community in Steinbach, and it was an emotional and powerful day for us all”. Steinbach Manitoba is often portrayed as part of the “Manitoba Bible Belt”, and is considered by many to be a very conservative community. Many local politicians refused to attend or acknowledge Steinbach Pride in the lead-up to the event, with Conservative Member of Parliament Ted Falk indicating his contempt for the event, and Conservative MLA Kevin Goertzen and Mayor Chris Goertzen not in attendance. There has also been heated debate within the Hanover School Division over allowing students to organize “Gay Straight Alliances”, anti-bullying initiatives, as well as a policy that prohibits teachers from discussing sexual orientation or gender identity in classrooms. Despite these challenges, Steinbach has proven itself to be a strong and welcoming community, with countless residents cheering the parade as it marched by. It was noted that not a single “counter-protest” took place, and the event was a positive, exciting, and empowering experience for everyone. “Steinbach is at the forefront of this critical fight for human rights,” said Moist. “Hundreds of CUPE members work in Steinbach and area, and we stand with the entire community to ensure safe and inclusive workplaces for everyone”. This Saturday will be Steinbach’s first ever Pride March and celebration, and we are hoping to have a strong CUPE presence there. We will be marching down the streets of Steinbach in support of our LGBTTQ* members and allies. The march will begin from E.A. Friesen Park, and we are suggesting that CUPE folks meet and gather right outside of the park, at the corner of Elm St and Elmdale St. at 10:30am, so we can walk together in solidarity. The march will conclude at City Hall, where there will be speeches and celebration. CUPE has a strong reputation for fighting for all human rights and engaging in community events like this, where our members work and live. Please consider marching with us on Saturday, rain or shine. 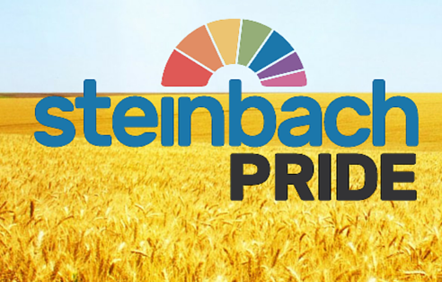 In addition to the Pride March for Equality Facebook page, the website for this event ishttp://www.steinbachpride.com and has all the information you need. WINNIPEG – One hundred years ago today, women in Manitoba became the first in Canada to win the right to vote and hold office in provincial elections. The labour movement and feminist movement have always had close ties throughout history and many shared fights for social justice and women’s rights continue to rage on today. Women are among the lowest paid workers across the country, and are more likely to not receive the same level of pension or benefits as men, by virtue of the type of work performed by women. Jobs in health care, child care, education, and social services are still among the lowest paid work in Canada, and there is no coincidence that these jobs are predominantly performed by women and newcomers. Credit must be given to the Manitoba government for consistent pay increases, as well as efforts to enhance wages in the lowest paid sectors including support workers in community living and child care. The province has also consistently increased the minimum wage, but the pay gap still exists and must continue to be remedied. Manitoba has also been a leader in breaking down barriers for transgender workers, and the Winnipeg School Division is currently drafting policy that would ensure students and staff could be addressed by the pronouns they choose. Aboriginal women and girls in Manitoba and across Canada continue to face disproportionate levels of racially motivated gender-based violence, and Manitoba has been a centre of grassroots-led activism to fight against racism and misogyny. It is also important to acknowledge on this date that not all women received the right to vote on January 28, 1916. Aboriginal women and many immigrant women were excluded. It wasn’t until 1947 that Chinese and Indo-Canadian women (and men) were granted the right to vote, and in 1948 Japanese women (and men) were granted the right to vote. In 1952 Aboriginal woman and (men) were granted the right to vote, and it wasn’t until 1960 that Aboriginal women (and men) were allowed to run for office without giving up their treaty rights. 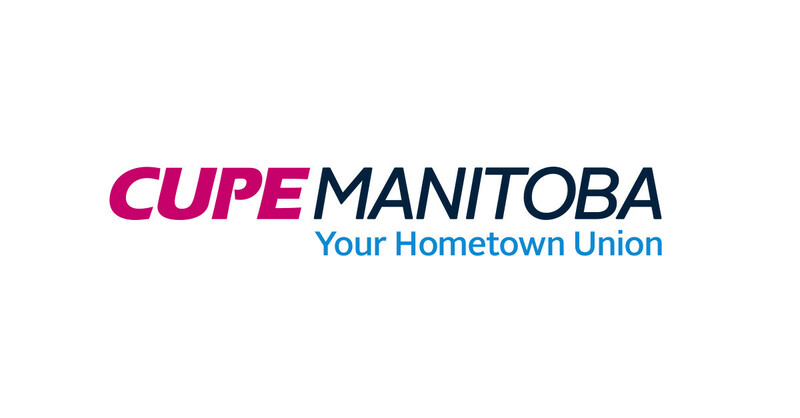 CUPE Manitoba represents 25,000 members in health care, education, municipalities, libraries, universities, social services, public utilities, transportation, emergency services and airlines. 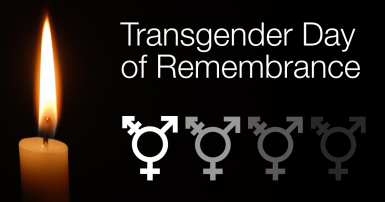 On November 20, workplaces and communities will take the time to observe Transgender Day of Remembrance and commemorate persons who have lost their lives because of anti-trans violence. Started in 1998 to honour the murder of a young transgender woman in Massachusetts, this day is now marked by ceremonies in cities across Canada and around the world. Let’s all continue to work together to help make our workplaces and communities a safe and inclusive space for those who identify as transgender. Steinbach, Manitoba – On November 9, 2015, members of CUPE Local 2348 at Agape House women’s shelter in Steinbach, Manitoba voted 100% in favour of strike action in order to place pressure on their employer to secure fair wages and new language in their collective agreement that would ensure policy to support employees who are victims of domestic violence. On November 16th, the Province of Manitoba announced that paid leave would be extended to victims of domestic violence, recognizing that people in these situations need the time and space to seek help. While this announcement is excellent news for victims of domestic violence province-wide, enshrining supportive language in workplace contracts should be every employer’s next step. Members of CUPE Local 2348 at Agape House held an info picket outside Steinbach City Hall, on Wednesday, November 18th to raise awareness on domestic violence in the workplace as well as fair treatment for women’s shelter staff. A study conducted by the University of Western Ontario and the Canadian Labour Congress that focused on the impacts of domestic violence in the workplace found that 91.5% of over 8,000 respondents reported that they thought domestic violence impacts the lives of workers. The survey also found that employers lose close to $80 million dollars every year due to the impact of domestic violence in the workplace. 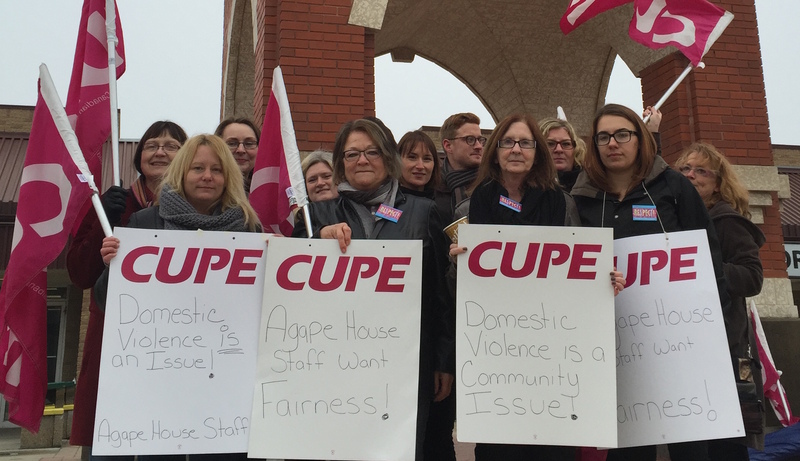 CUPE Manitoba echoes calls for increased funding to women’s shelters province-wide in order to help provide staff with fair wages and supports to enable them to perform their important work. Currently staff at Agape House in Steinbach can make significantly less than those performing similar work in shelters in Winnipeg. Winnipeg – Manitoba Premier Greg Selinger offered a new, progressive vision for the province at Monday’s annual speech from the throne, including a first-of-its-kind pledge to provide paid leave for victims of domestic violence. This year’s Throne Speech reflects the nation-wide calls for action on numerous key issues, both domestic and international, positioning Manitoba as a clear leader on social justice and progressive economic growth. Highlights of the Throne Speech include extending paid leave to victims of domestic violence, support for Syrian and other refugees, a renewed call for a national inquiry on missing and murdered Indigenous women, a renewed commitment to building the Shoal Lake 40 freedom road, investments in infrastructure and rapid transit, stable funding for colleges and universities, and a commitment to building 12,000 affordable childcare spaces. The Throne Speech further commits to protecting Manitoba’s crown corporations against privatization. 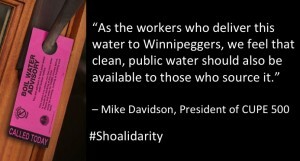 WINNIPEG – The municipal workers who deliver Winnipeg’s water have joined those calling for the building of an all-weather access road to Shoal Lake #40 First Nation. 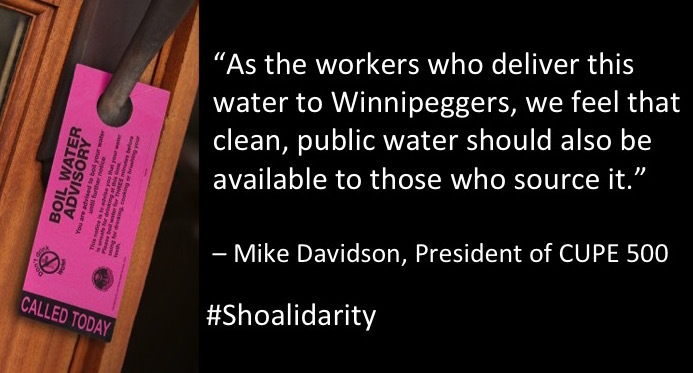 On July 21, 2015, CUPE Manitoba officially endorsed the Shoal Lake #40 “Freedom Road” campaign by sending a letter to Chief Erwin Redsky indicating the support of Winnipeg’s municipal workers, as well as a letter to Aboriginal Affairs Minister Bernard Valcourt urging him to act immediately to improve the living conditions of the people of Shoal Lake #40. CUPE MB Aboriginal Council attended National Aboriginal Day, collecting petitions calling for clean water for all Aboriginal communities. While the federal government refuses to commit funding to help Shoal Lake #40 gain access to potable water and services via an all-weather road, Canadians from all levels of civil society are taking initiatives to support the community – from petitions, to writing letters to Members of Parliament, to fundraising. CUPE Local 500 has been outspoken against the privatization of water and wastewater treatment, and is a staunch advocate for continued investments in public water infrastructure. Shoal Lake #40 First Nation is located at the Manitoba-Ontario border south of the Trans-Canada highway. Shoal Lake has provided Winnipeg’s drinking water since 1919 via a 153 km aqueduct. The population of Shoal Lake #40 is 270, and the community has been under a boil water advisory for the past 17 years. The community spends approximately $100,000 per year importing bottled water, despite supplying 700,000 Winnipeggers with water from the nearby lake and reservoir. Currently there is no all-weather road access to the community, which must travel via boat during the summer, or cross the ice in the winter to fetch basic supplies and drinking water. At least 9 community members have died taking this journey. The cost of building the all-weather “Freedom Road” to connect the community to the Trans-Canada highway is estimated at $30 million. All levels of government have committed $1m towards a road plan. The Province of Manitoba and the City of Winnipeg have each committed to contribute a share of the cost towards the project, but the federal government has not committed, leaving the community at risk. CUPE believes that water is a basic human right. There are still far too many communities across Canada under boil water advisories, and CUPE will continue to push for safe, public drinking water for all. CUPE Local 500 represents approximately 4,200 municipal workers in Winnipeg. CUPE members and activists joined over 10,000 people in the 2014 Winnipeg Pride parade held on Sunday, June 1. “Our union works tirelessly each and every day to end homophobia, transphobia, sexism, and discrimination in our workplaces” said Kelly Moist, President of CUPE Manitoba “many of our members face these issues daily, and we are proud to stand up and speak out against this form of hatred”. 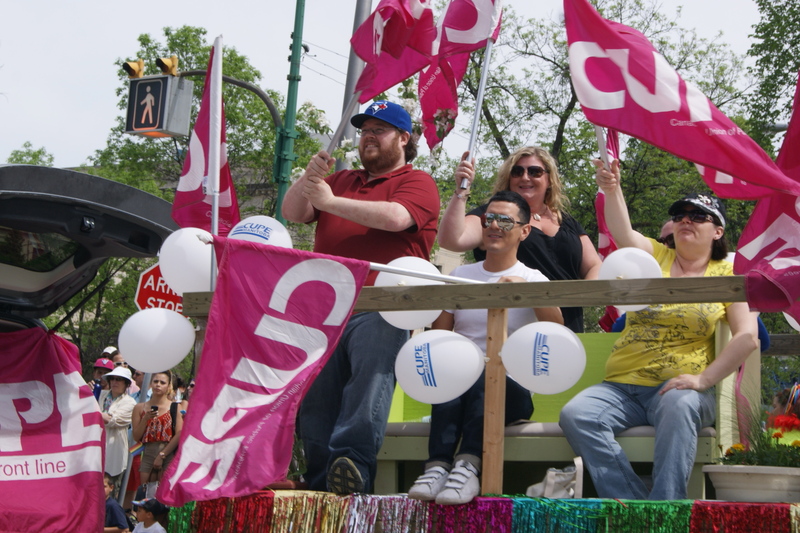 This year, the CUPE Manitoba Human Rights Committee and the CUPE Manitoba Young Members Committee joined together to host a colourful parade float, decorated in both Pride and CUPE flags. “By being a visible part of Pride we hope not only to celebrate the LGBTTQ* community, but to also send a message to the broader community” said Moist “if there is any form of discrimination in our workplaces, we will be there to fight it”. The Pride Winnipeg Festival started in 1987, and CUPE Manitoba has supported the festival over countless years. We would like to invite you to the following Rally on Thursday. The Institute for International Women’s Rights-Manitoba will be supporting this march from Portage Place, to the Legislative Building. We hope you can make it too. The protest march shall begin at 391 Portage Place nearby the bus shelter and end at the Manitoba Legislative building, downtown, Winnipeg. Let our voices re-echo the worldwide condemnation of the violence and nefarious atrocities orchestrated against the Nigerian girls, people and humanity at large by the extremist and terrorist group Boko Haram. Join us in this historic March to free the very future of our world. If you are able, the dress code shall be red shirts/T-shirts in solidarity with their families and supporters.